When Super Typhoon Haiyan hit the Philippines it killed more than 6000 people and left 4.4 million homeless. Angie Gittus, a Clinical Nurse Specialist in emergency at the Murwillumbah Hospital, volunteered her skills in the aftermath. “I volunteered in the Philippines following Super Typhoon Haiyan with the idea that I was the one giving. Now I know that I was the one who was gifted. What I will remember most from my experience is the enormous heart of the Filipino people. The gratitude expressed to us for every little thing we did. The hospitality shown to us by people who had nothing – in some cases less than nothing ­– was humbling. The resilience of the people, to get up after such tragedy and keep going with life, was astounding. Their hopefulness in the face of such adversity was an inspiration. I was gifted with the amazing generosity of their spirit and I was gifted with renewed appreciation for just how incredibly lucky I am. It was two weeks since the assault of Haiyan when we finally arrived in the small town of Basey, north of Tacloban and set up a clinic. By then, time had triaged those with severe injuries – people had either survived or perished. The main need was for primary health care: treatment for wounds and skin infections, headaches and musculo-skeletal pains, respiratory tract infections and asthma, fevers and gastrointestinal tract problems. There were clean-up injuries. A lot of cuts and puncture wounds from moving debris. Along with the supplies we brought from Australia we managed to source some tetanus vaccines and gave out all that we had. Medications such as antihypertensives, hypoglaecymic agents and ABs for TB, were needed as people’s tablets were washed away along with their homes. There were healing fractures that would have benefitted from reduction/relocation at the time of the injury and an incredible electrocution burn (entry and exit burns) on a surprisingly alive man! One lady presented with chest pain and a cough after being struck by a falling tree during the typhoon. When trying to determine how to treat her, without x-ray, CT or pathology, we had to fall back on the skills of look/listen/feel and really think about the pathophysiology of injury. Many people came in for “blood pressure check” and after we’d attended all their obs, listened to lung fields, checked them out as A1 physically they’d disclose that they’d lost their home, a friend, or a member of their family during the typhoon. What they wanted was reassurance and understanding. They wanted to know that someone, that the international community, cared about their loss. These were the people we felt most at a loss to help. We had analgesics, antibiotics, dressings and fluids with us, but we could do nothing to ease their emotional pain except listen and express our sympathy. We hugged them, we cried with them, we laughed with them and we showed them that they mattered. And although that’s not measurable, I feel it made a difference. Our team of 11 clinicians, the first of three deployments by Medical Rescue Australia, treated more than 1300 people in one week. We worked in an old school hall that miraculously had its roof intact. Each day half the team went by truck or boat to provide medical care to people unable to travel into town. It was unbelievably hot and humid and every day we put on a uniform of thick socks, boots, long sleeved shirts, long pants and hats to protect us from the rubbish and debris. We slept on yoga mats on a concrete floor and washed with a bucket of water. The conditions were rough but I’ve never been happier to work so hard. Although it had no roof, the homeless were living in the local church under a leaking tarpaulin. Mass was still held three times a day. For the first time in my life I felt an appreciation for religion, for the strength it can give in times of hardship. The Filipino people have enormous faith. Perhaps when you have nothing the importance of something intangible like faith, that can’t be taken away from you, is amplified, and that was all a lot of them had left. 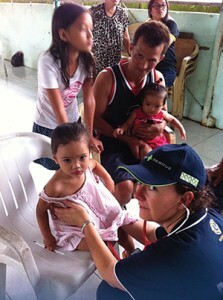 Angie Gittus volunteered through Medical Rescue Australia www.medrescue.com.au. If you want to donate, two major international NGOs – Médecins Sans Frontières Australia (www.msf.org.au) and Australian Red Cross (www.redcross.org.au) are still on the ground in the Philippines.